Greetings to all of you from the team! Our Saturday was filled with the wonders of our Lord, from start to finish. We began the day sorting through and organizing the many bags of donations we brought, thanks to your overwhelming generosity. The laptops, bibles, medical supplies, books, and clothing are so needed here and are greatly appreciated by Steve & Mary and the people served by Camp Brethren Ministries. In the midst of our sorting we got word that a young mother was almost ready to give birth at the CBM Clinic, located right next to our camp. This type of circumstance was a specific prayer of both Pete and Roxana. Pete has been an EMT for years, but never had a chance to assist directly with a birth. Roxana has been praying for such an opportunity every year even been here, but it hadn’t happened. They both beelined for the clinic, and about 2 hours later, by the grace of God, young mother Faith gave birth to a healthy 9 lb. baby boy, coincidentally named Peter! Needless to say, everyone involved was ecstatic! 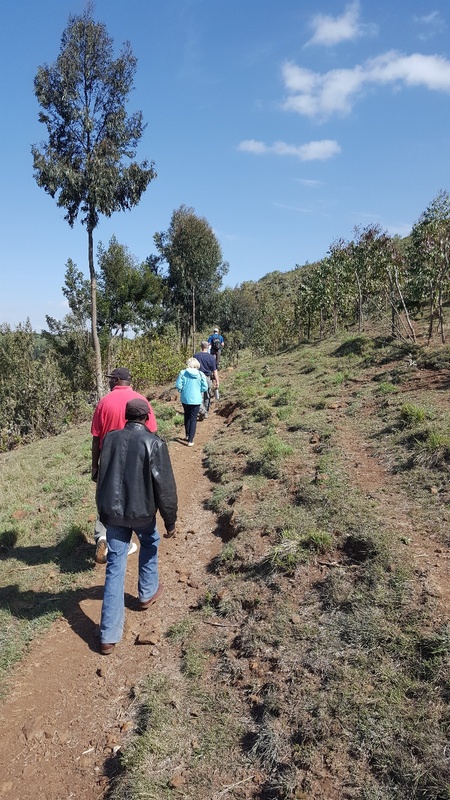 In the early afternoon the team got to hike up to the CBM water project on the side of the mountain. Local Guide Douglas showed the way and explained in great detail how steam from thermal waters deep below the Earth’s surface (Eburru sits on a dormant volcano) are harnessed to provide a clean water source for this area. No small miracle of a provision for the people of Eburru, who often struggle with prolonged droughts! In the late afternoon we went to the school to be with the boarding and orphan students, who sang several worship songs for us, including two songs taught to then by our DHI teams in previous trips. They brought our team up for introductions and a brief Q&A session, so they could learn more about us. We prayed with them and promised to be back for their weekly entertainment time in the evening. After dinner, we rejoined the students for a fun-filled time of music and dancing and the joy of watching young students relax and have a blast. Several of our team enthusiastically joined in as the kids showed us many new dance moves! I tried to attach a short clip from our fun time with them, but unfortunately the email wouldn’t send with this limited connection. We’ll definitely have to show you later!! After a very full and fun day, we returned to camp about 9:30pm to debrief the day and finalize plans for our participation with the Sunday worship services. We are excited to be with our Kenyan brothers and sisters as we all corporately worship our most gracious and loving God! Everyone on the team is doing very well and we all look forward to what’s in store! Our Sunday was a wonderful day (and night) filled with enthusiastic worship and warm, uplifting fellowship. Just after breakfast this morning we joined the students at school for their weekly worship service. The team led a song and Nathan delivered a brief devotional for the approximately 190 students, who were very energetic in their praise and worship. Following that, we traveled to the Jerusalem church to join the weekly worship service of Pastor Steve’s church. The church was packed with many people, from young to old. The team introduced themselves and again led a song for the congregation. Pete then gave a very good sermon on 1 Corinthians 12, his first time ever doing so! Several folks from the church were so moved that they came forward to join Pastor Steve on the altar for personal prayer. We left the church almost 3 hours later to grab a late lunch, then most of us drove to Naivasha for supplies. Pete stayed to help Mary at the clinic, and Nathan helped with a math tutoring session at the school for the class 8 students, and also helped staff prepare dinner for the kids. Later we were all together again, this time hosting the teachers for a special appreciation dinner at the school. It was a terrific time of fellowship and fun for the appr. 50 of us who were in the room! Each one, American and Kenyan, had a chance to talk about themselves and discuss the importance of the work being done at Camp Brethren School by the grace of our Lord. The progress being made here is nothing short of amazing! Thanks again for your ongoing support and prayers, you are impacting our trip in powerful ways!